HUGE Historic Hollywood Hills Townhome! Views, Close2 everything! ONLY AVAILABLE THE NEXT TWO WEEKS until May 1 , 2019, as we are converting back to long term tenancy. 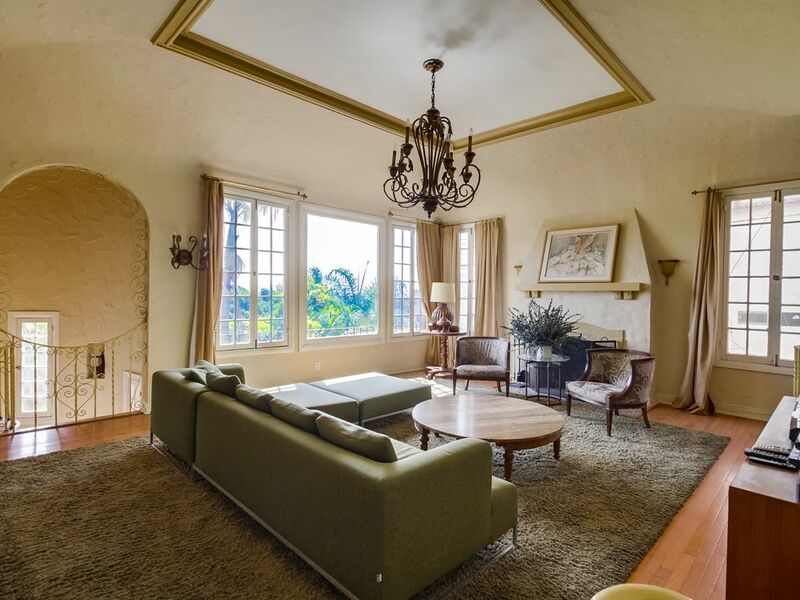 Amazing Enormous 2200 square foot Spanish-Style Two-story Townhome built in 1926 with breathtaking views of Hollywood and downtown Los Angeles in the charming, historic, neighborhood of HOLLYWOOD HEIGHTS. We also have a large 2 bedroom unit in the same building, so if you have a larger group you may book both to accommodate your party if they are both available (#449198). Hollywood Living at it's Finest! Just 5 BLOCKS from the Metro and the world-famous Grauman's Chinese Theatre, yet still private and intimate. Why drive when it's a quick walk down to EVERYTHING? Want to go to the Hollywood Bowl? Four blocks. Get on the freeway? Five blocks, yet it is completely unheard and unseen. LOCATION, LOCATION, LOCATION!! Originally built for a silent film star, this home has had a long history of famous tenants, including the Oscar-Winning screenwriter of 'The Sting'! Ten-foot ceilings in the living room are flanked by 5' tall windows and fireplace and beautiful spiral staircase with original 1920's ironwork. The Master Bedroom has its own fireplace, and Bedroom 2 has views of another less-known Hollywood landmark, the statuesque Hightower! Both full bathrooms have showers. There is a washer/dryer located in the garage, and keyless entry at both entrances. The courtyard is available for your use, and is shared with one permanent tenant, but the property has it's own entrance outside of the courtyard if complete privacy is desired. Heating is central (separated by floor), and each room has its own AC wall unit. We’ve recently added updated lighting to all the bedrooms, dining room and courtyard. This townhome was gorgeously appointed by a professional designer with high-end furnishings including B&B Italia sofa, B&B Italia bed, mid-century modern pieces by top designers of the era, lots of fine art, as well as contemporary and antique pieces, and four flat screen TVs. We know you will not want to leave this beautiful home. There is a small one car garage for your use. If you plan on using it (recommended! ), please bring a small to medium size car, or be prepared for some extra maneuvering. Street parking is free and there is a parking permit for your use. The main living area is street level, and all 3 bedrooms are located on the floor below, accessed by the spiral staircase in the living room. There is NO smoking inside this property of any kind, but guests may smoke on the porch and outdoor area. If any evidence of smoking is found within the premises, guests will forfeit their deposit. Pets are ONLY ALLOWED WITH PRIOR APPROVAL. Last minute guests must provide ID and present the credit card used for the reservation. For fraud protection, we do call the credit card company for verification of funds in those cases. When making a request, please send an VRBO EMAIL request first before calling, thanks! We try to keep thorough electronic records so we can better serve you and avoid booking complications! There is a 3-Night Minimum Stay unless there's last minute vacancy, and there is also a cleaning fee of $150. Please ask about availability as the calendar is not always accurate, but we do our best to keep it current. For the refundable deposit, if there is no damage found post-stay or other expenses due, it is refunded automatically directly from VRBO , which begins processing 7 days after your departure. Hollywood Walk of Fame, Hollywood & Highland, Tours of the Stars Homes, Kodak Theatre, Disney's El Capitan Theatre, Grauman's Chinese Theater, Madam Tussauds, Hollywood Bowl, Hollywood & Vine, Pantages Theatre, Jimmy Kimmel Live, Hollywood Christmas Parade, as well as the newest and hottest night clubs, bars, & restaurants in Los Angeles. Griffith Park, The Observatory, Downtown Los Angeles, Staples Center, LA County Museum, MOCA, Little Tokyo, Japanese American Museum of Art, Geffen Contemporary Museum, the Disney Music Hall, China Town, LA Zoo, Farmers Market at the Grove, West Hollywood, Beverly Hills, Santa Monica Beach, Malibu, Pasadena Rose Bowl & Rose Parade, Getty Center Museum & Getty Villa Malibu, Norton Simon Museum, Disney Land, Six Flags, Watts Towers, Hollywood Sign, Malibu Beach, Los Angeles International Airport, Burbank, Burbank Airport, North Hollywood, Studio City, and MUCH MORE! Hello, we are Kevin and Gordon! Gordon is a floral designer and producer of events, and Kevin is an entertainer. LOCATION! LOCATION! LOCATION! THIS IS THE PERFECT LOCATION. HISTORIC, PEACEFUL, RESIDENTIAL, BUT IN THE MIDDLE OF EVERYTHING EXCITING! WALKING DISTANCE OR A SHORT DRIVE TO HOLLYWOOD LANDMARKS, HOLLYWOOD STUDIOS, ACADEMY AWARDS, UNIVERSAL STUDIOS, MUSICIANS INSTITUTE, ROOSEVELT HOTEL, YAMASHIRO, MAGIC CASTLE, MANN'S CHINESE THEATRE, WAX MUSEUM, WORLD CLASS RESTAURANTS, NIGHT CLUBS, BARS, AND SHOPPING. there is a porch and bricked courtyard. We stayed for 6 days 2 adults and 2 teens. Plenty of room. Great view. We used Lyft and Uber to go to tourist spots and this location suited that very well. We were comfortable .Would recommend. We felt like we had found old style Hollywood wondering around this property. Beautiful furniture and interesting art, some lovely period design features and stunning views. And very comfortable beds . Lovely quiet area. Kevin was really helpful and quick to respond - he really made sure we had the access details and was clearly aware to be on hand for our expected arrival. Of course in an older property there are things that one could sight as needed renovating / fixing - but its a careful balance between overdeveloping and losing the charm. We travelled into Hollywood/ Beverley Hills /LA / Santa Monica - all an way Uber away. Thanks Kevin - it was a privilege to experience your property . This is a very nice home on a very tight street with limited parking, but the view was great. For those of you not familiar with the area, the tight streets are the norm, so don't be surprised. The house actually is historic if you care to do some minor research. The booking was short-notice, but went very smoothly. Kevin responded to our booking request within an hour, which we greatly appreciated. We unexpectedly accepted a wedding invitation and the pickings of available homes was slim, but Kevin accommodated us without issue. Upon arrival we had a few questions that were answered within minutes, which made the rest of the weekend run very well. The house was very clean and towels were plentiful. The washer/dryer is in the garage, which is difficult to get to if you need to park inside, but they're there and run very well. The neighborhood is very quiet, and we met several very nice people each time we went for a walk. Hollywood Boulevard is only a 15-20 minute walk (I walk very fast). The Hollywood sign is visible from a spot only 2-3 minutes up the street if your thing is to see it. Overall, this home should be a definite YES on your list if available for your dates. Kevin and his team are very nice and helpful, and (Shhhh), he may be renting to a celebrity in the unit next door when you're there. Our neighbor was very nice. Plus Plus Plus. Kevin was a huge help, the house was beautiful and it came with everything you’ll need! Thanks again Kevin, hope to visit again. Thoroughly enjoyed our stay at this rental. Very relaxing atmosphere with plenty of room. The home had everything we needed for a perfect visit. The view was awesome. We would stay at this home again if we are ever in the area. Recommend a very small vehicle for parking in the garage. Owner, Kevin Shea, is very easy to communicate with. Great location. Perfect for a family of four. We would stay there again. For bookings of less than 3 nights, please send us an email inquiry to request an exception. Pet Deposit is an additional $250.00. Pets ONLY accepted with prior approval. Your reservation may be cancelled without refund if a pet is brought without permission, or guests (or guests of guests) smoke inside the property. Do not move furniture without approval, as the only damage to ever occur at the property is from guests moving pieces improperly.